Not to be confused with Docklands Stadium, formerly named Etihad Stadium, in Melbourne, Australia. The City of Manchester Stadium in Manchester, England, currently known as the Etihad Stadium for sponsorship reasons, is the home of Manchester City and, with a domestic football capacity of 55,097, the fifth-largest in the Premier League and tenth-largest in the United Kingdom. Built to host the 2002 Commonwealth Games, the stadium has since staged the 2008 UEFA Cup Final, England football internationals, rugby league matches, a boxing world title fight, the England rugby union team's last match of the 2015 Rugby World Cup and summer music concerts during the football off-season. The stadium, originally proposed as an athletics arena in Manchester's bid for the 2000 Summer Olympics, was converted after the 2002 Commonwealth Games from a 38,000 capacity arena to a 48,000 seat football stadium at a cost to the city council of £22 million and to Manchester City of £20 million. Manchester City F.C. agreed to lease the stadium from Manchester City Council and moved there from Maine Road in the summer of 2003. The stadium was built by Laing Construction at a cost of £112 million and was designed and engineered by ArupSport, whose design incorporated a cable-stayed roof structure which is separated from the main stadium bowl and suspended entirely by twelve exterior masts and attached cables. The stadium design has received much praise and many accolades, including an award from the Royal Institute of British Architects in 2004 for its innovative inclusive building design and a special award in 2003 from the Institution of Structural Engineers for its unique structural design. In August 2015, a 7,000 seat third tier on the South Stand was completed, in time for the start of the 2015–16 football season. The expansion was designed to be in keeping with the existing roof design. After successful athletics events at the Commonwealth Games, conversion into a football venue was criticised by athletics figures such as Jonathan Edwards and Sebastian Coe as, at the time, the United Kingdom still lacked plans for a large athletics venue due to the capability of installing an athletics track having been dropped from the designs for a rebuilt Wembley Stadium. 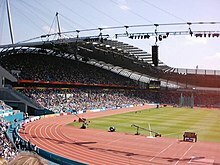 Had either of the two larger stadium proposals developed by Arup been agreed for funding, then Manchester would have had a venue capable of being adapted to hosting large-scale athletics events through the use of movable seating. Sport England wished to avoid creating a white elephant, so they insisted that the City Council agree to undertake and fund extensive work to convert CoMS from a track and field arena to a football stadium, thereby ensuring its long-term financial viability. Sport England hoped either Manchester City Council or Manchester City F.C. would provide the extra £50 million required to convert the stadium to a 65,000 seater athletics and footballing venue with movable seating. However, Manchester City Council did not have the money to facilitate movable seating and Manchester City were lukewarm about the idea. Stadium architects Arup Sport believed history demonstrated that maintaining a rarely used athletics track often does not work with football – and cited examples such as the Stadio delle Alpi and the Olympic Stadium with both Juventus and Bayern Munich moving to new stadiums less than 40 years after inheriting them. The first public event at the stadium was the opening ceremony of the 2002 Commonwealth Games on 25 July 2002. Among the dignitaries present was Queen Elizabeth II who made a speech, delivered to her in an electronic baton, and 'declared the Commonwealth Games open'. During the following ten days of competition, the stadium hosted the track and field events and all the rugby sevens matches. Sixteen new Commonwealth Games track and field records (six men's and ten women's) were set in the stadium, eight of which (three men's and five women's records) are still extant after three subsequent series of Games in 2006, 2010 and 2014. Prior to the 2012 Summer Olympics held in London, the 2002 Games was the largest multi-sport event ever to be staged in the United Kingdom, eclipsing the earlier London 1948 Summer Olympics in numbers of teams and competing athletes (3,679), and it was the world's first multi-sport tournament to include a limited number of full medal events for elite athletes with a disability (EAD). In terms of number of participating nations, it is still the largest Commonwealth Games in history, featuring 72 nations competing in 281 events across seventeen (fourteen individual and three team) sports. Sections of the track were removed and relaid at other athletics venues, and the internal ground level was lowered to make way for an additional tier of seating, on terracing already constructed then buried for the original configuration. The three temporary stands with a total capacity of 16,000 were dismantled, and replaced with a permanent structure of similar design to the existing one at the southern end. This work took nearly a year to complete and added 23,000 permanent seats, increasing the capacity of the converted stadium by 7,000 to approximately 48,000. Manchester City F.C. moved to the ground in time for the start of the 2003–04 season. The total cost of this conversion was in excess of £40 million, with the track, pitch and seating conversion being funded by the city council at a cost of £22 million; and the installation of bars, restaurants and corporate entertainment areas throughout the stadium being funded by the football club at a cost of £20 million. The Games had made a small operating surplus, and Sport England agreed that this could be reinvested in converting the athletics warm-up track adjacent to the main stadium into the 6,000 seat Manchester Regional Arena at a cost of £3.5 million. The stadium is owned by Manchester City Council and leased by the football club on a 'fully repairing' basis. All operating, maintenance and future capital costs are borne by the club; who consequently receive all revenues from stadium users. The 2008 takeover made the football club one of the wealthiest in the world, prompting suggestions that it could consider buying the stadium outright. 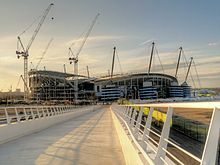 Manchester City signed an agreement with Manchester City Council in March 2010 to allow a £1 billion redevelopment led by architect Rafael Viñoly. During the 2010 closed season the football pitch and hospitality areas were renovated, with a £1 million investment being made in the playing surface so that it is better able to tolerate concerts and other events without damage. 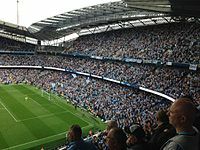 In October 2010, Manchester City renegotiated the stadium lease, obtaining the naming rights to the stadium in return for agreeing to now pay the City Council an annual fixed sum of £3 million where previously it had only paid half of the ticket sales revenue from match attendances exceeding 35,000. This new agreement occurred as part of a standard five-year review of the original lease and it amounts to an approximate £1 million annual increase in council revenues from the stadium. During 2011–14, the club sold all 36,000 of its allocated season tickets each season and experienced an average match attendance that is very close to its maximum seating capacity (see table in previous section). Consequently, during the 2014–15 season, an expansion of the stadium was undertaken. The South Stand was extended with the addition of a third tier which, in conjunction with an additional three rows of pitch side seating, increased stadium capacity to approximately 55,000. Construction commenced on the South Stand in April 2014 and was completed for the start of the 2015–16 season. When planning the development, Manchester City Council required a sustainable "landmark" structure that would be an "icon" for the regeneration of the once heavily industrialised site surrounding Bradford Colliery, as well as providing spectators with good sightlines in an "atmospheric" arena. Arup Associates designed the stadium to be "an intimate, even intimidating, gladiatorial arena embodying the atmosphere of a football club" with the pitch six metres below ground level, a feature of Roman gladiatorial arenas and amphitheatres. The attention to detail, often absent in stadium design, has been remarked upon, including the cigar-shaped roof supports with blue lighting beacons, sculpted rainwater gutters, poly-carbonate perimeter roof edging and openable louvres to aid pitch grass growth with similarities also made to high-tech architecture. The stadium's interior comprises a continuous oval bowl, with three tiers of seating at the sides, and two tiers at each end. Entry by patrons is gained by contactless smart card rather than traditional manned turnstiles. The system can admit up to 1,200 people per minute through all entrances. A service tunnel under the stadium provides access for emergency vehicles and the visiting team's coach to enter the stadium directly. Once inside the stadium patrons have access to six themed restaurants, two of which have views of the pitch, and there are 70 executive boxes above the second tier of seating in the north, west and east stands. The stadium is equipped with stand-by generators should there be a electrical mains failure. These are capable of keeping the stadium electrics running as well as the floodlights at 800 lux, the minimum level stipulated by FIFA to continue to broadcast live football. The stadium was named the City of Manchester Stadium by Manchester City Council before construction began in December 1999, but has a number of commonly used alternatives. City of Manchester Stadium is abbreviated to CoMS[pronunciation?] when written and spoken. Eastlands refers to the site and the stadium before they were named SportCity and CoMS respectively, and remains in common usage for both the stadium and the whole complex, as does SportCity but with less frequency. The stadium was also officially referred to as Manchester City Stadium for the 2015 Rugby World Cup. The football club, under its new ownership, renegotiated its 250-year lease with the city council in October 2010, gaining the naming rights in return for a substantial increase in rent. The stadium was renamed the Etihad Stadium by the club in July 2011 as part of a ten-year agreement with the team kit sponsors Etihad Airways. The agreement encompasses sponsorship of the stadium's name, extends the team kit sponsorship for ten years, and relocated the club's youth academy and training facilities to the City Football Academy onto the Etihad Campus development across the road from the stadium. The Metrolink tram stop serving the stadium is named 'Etihad Campus'. The North Stand is the only part of the stadium built after the Commonwealth Games, during the stadium's conversion. The temporary unroofed north stand it replaced had been dubbed the New Gene Kelly Stand by supporters, a reference to the unroofed corner between the Kippax and the North Stand at the club's former Maine Road home, because, being exposed to the elements, they frequently found themselves "singing in the rain". Commencing season 2010–11, seating in the North Stand has been restricted to only supporters accompanied by children, resulting in this end of the ground now being commonly referred to as the Family Stand. Although the North Stand has never been officially renamed and is still frequently referenced that way, most external ticketing offices and stadium guides, in addition to the club itself, now preferentially label and refer to this section of the ground as the Family Stand when discussing seating and ticket sales. Supporters initially dubbed the South Stand the Scoreboard End (the former name of the North Stand at Maine Road), and it houses the majority of City's more vocal fans. Supporters of visiting teams are also normally allocated seats in this stand, as it has ready access from the visitor supporter coach park. From 2003 to 2006, the South Stand was renamed the Key 103 Stand for sponsorship reasons, though this was largely ignored by regular patrons. The November 2018 consultation exercise on further expansion options envisages the North Stand then becoming the 'Home End', with no corporate hospitality areas, a greatly extended second tier, "affordable" ticket prices and possible areas capable of conversion to safe standing. The 'singing area' would then be in the North Stand, and the 'Family Stand' would be relocated elsewhere in the Stadium. The stadium is the centrepiece of SportCity, which includes several other nationally important sporting venues. Adjacent to the stadium is the Manchester Regional Arena, which served as a warm-up track during the Commonwealth Games and is now a 6,178-capacity venue that hosts national athletics trials, but has previously also hosted the home games of both the Manchester City women's team and the club's under-21 reserve team. The Regional Arena has regularly hosted the AAA Championships and Paralympic World Cup, and is currently the home ground of amateur rugby league side Manchester Rangers. The National Squash Centre and the National Cycling Centre, which includes both the Manchester Velodrome and the National Indoor BMX Arena, are all a short distance from the stadium. The Squash Centre, which has hosted the British National Squash Championships since 2003 was added to the SportCity complex for the Commonwealth Games along with CoMS. The Velodrome, another showpiece venue used to stage all the track cycling events for the Games, was already in place and had been home to British Cycling, the governing body for cycling in Britain, since it was built in 1994, as part of Manchester’s unsuccessful 2000 Olympics bid. Prior to the completion of the Lee Valley VeloPark for the 2012 Summer Olympics, the Velodrome had been the only indoor Olympic-standard track in the United Kingdom. The collocated BMX Arena houses the United Kingdom’s only permanent indoor BMX track and provides seating for up two thousand spectators. It was added to the National Cycling Centre at SportCity in 2011. Other major sporting and sport-related venues located in SportCity in the immediate vicinity of the Etihad Stadium, all legacies of the 2002 Commonwealth Games are the English Institute of Sport, west of the stadium, adjacent to the southwest corner of the Regional Arena; the Manchester Regional Tennis Centre, adjacent to the north end of the stadium; and the Manchester Tennis & Football Centre, also adjacent to the stadium, which is operated and administered by the Manchester Sport and Leisure Trust. Between 11 March (Commonwealth Day) and 10 August 2002, as part of the preparations for the upcoming Commonwealth Games and to celebrate Her Majesty the Queen's Golden Jubilee, a national Spirit of Friendship Festival was organised. On 9 July, a few weeks before the Games began, a sculpture outside the new national headquarters of the English Institute of Sport at SportCity was unveiled by the middle-distance runner Steve Cram. This sculpture, commissioned in late 2001, was created in a little over eight weeks by Altrincham-based artist, Colin Spofforth, who had submitted to Manchester City Council his idea for a heroic-sized sculpture of a sprinter as a means of celebrating the beauty, power and determination of the competing athletes. 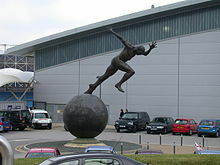 Reaching thirty feet high, weighing seven tonnes, and titled The Runner, this unique larger-than-life bronze statue of a male sprinter surmounting a bronze globe was, at the time, the United Kingdom's largest sporting sculpture. It depicts the very moment the runner leaves the blocks once the starter's gun has fired. From 2005 to 2009 a Thomas Heatherwick sculpture, B of the Bang, was situated to the southeast of the stadium at the junction of Ashton New Road and Alan Turing Way. Built after the Commonwealth Games to commemorate them, it was the tallest sculpture in the United Kingdom. However, numerous structural problems led to the 184 ft. sculpture being dismantled in 2009 for safety reasons. In 2014, money recovered by the Manchester City Council as a result of lengthy legal battles consequent to this debacle was used to fund a new £341,000 public sculpture a few hundred yards further south. 2011–12 saw the Etihad Stadium play host to the setting of a number of new club and Premier League footballing records, such as the club becoming the first ever team to win eleven of its opening twelve games in a Premier League season, and going on to remain unbeaten at the Etihad Stadium in all nineteen of the Premier League games played there. The club's record of 55 home points out of a possible 57 at the stadium is a joint best Premier League record, and the club's record of twenty consecutive home wins at the stadium (going back to the end of the previous season) also set a new Premier League record in March 2012. The record football attendance at the stadium not involving its host team Manchester City is 43,878, which was set at the 2008 UEFA Cup Final game between Zenit Saint Petersburg and Rangers on 14 May 2008. As is customary for such games, the then 47,715 maximum physical capacity of the stadium had been reduced by UEFA to around 44,000 for this final. However, neither limit would have been able to accommodate the vast number of supporters of the Scottish club, estimated to be in excess of 130,000, that travelled down from Glasgow to Manchester on the day of the game, despite the club's official ticket allocation being just 13,000 and police requests for fans without tickets to stay home. This order of magnitude mismatch between the numbers of traveling fans and those holding tickets ultimately led to a serious public disorder incident in the centre of the city now inextricably associated with this final, despite the fact that the 44,000 or so crowd who watched the game inside the stadium were perfectly well-behaved. 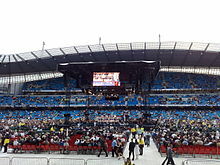 In July 2011, CoMS was renamed the Etihad Stadium, sponsored by Etihad Airways who fought off competition from Ferrostaal and Aabar to gain the stadium naming rights. The lucrative ten-year sponsorship deal included not just the naming rights to the stadium itself but to the whole £200 million complex of football-related facilities into which it was soon to be incorporated. In mid-September 2011, development plans were duly announced for a new state-of-the-art youth academy and training facility, now known as the City Football Academy (CFA) to be built on derelict land adjacent to the stadium and which would include a 7,000 capacity mini-stadium plus fifteen additional outdoor football pitches, six swimming pools and three gyms. The planned CFA facility was not only to become the new home base of the Manchester City first team squad, reserve (under-21 youth) team squad, and all of the Academy younger age group squads, but also the new home of the prior loosely affiliated Manchester City Ladies team (which was re-branded in 2012 as Manchester City Women's F.C. and more formally merged into the Manchester City family of affiliated football teams). Also fully integrated into the new CFA facility would be the parent club's world headquarters. As part of Manchester City's commitment to community outreach in their redevelopment plans for the areas of East Manchester adjacent to the Etihad Stadium, other urban regeneration plans incorporated into the overall Etihad Campus development project include the new £43 million Beswick Community Hub, that includes Connell Sixth Form College; a community leisure centre (with swimming pool, dance studio, health and fitness gym, rugby pitch, and grass sports pitches); and a planned Manchester Institute of Health and Performance. On 26 November 2014, the same day the SuisseGas Bridge was officially opened, a "globally admired" grouping of stainless steel sculptures, consisting of three towering metallic chess pieces called Dad's Halo Effect by its internationally acclaimed creator, Ryan Gander – was likewise unveiled to the public. Commissioned by the Manchester City Council to represent both the past industrial and current sporting heritage of this area of east Manchester, the public artwork is located in front of the Connell Sixth Form College, close to the central circus of the Beswick Community Hub and only a few hundred yards south from where the area's last public sculpture, B of the Bang, had been situated. 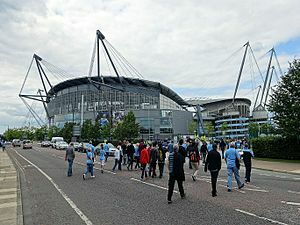 The stadium is 2.5 km east of Manchester city centre. Manchester Piccadilly railway station, which serves mainline trains. It is a twenty-minute walk away along a well-lit signposted route that is supervised by stewards close to the ground. 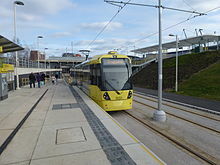 Piccadilly station also has a Metrolink tram stop (in the undercroft); from which regular trams along the East Manchester Line to Ashton-under-Lyne serve the stadium and Etihad Campus, with enhanced service frequencies and doubled tram units on matchdays. The Etihad Campus tram stop close to Joe Mercer Way to the immediate north of the stadium opened in February 2013, and handles several thousand travellers each matchday; spectators travelling by tram from Manchester city centre being able to board services at Piccadilly Gardens, the journey taking approximately 10 minutes. The Velopark tram stop also opened in February 2013 and provides access to the southeastern approach to the stadium, as well as closer access to other areas of SportCity such as the Manchester Velodrome and the City Football Academy. Outside the football season the stadium hosts annual summer concerts, and is one of the United Kingdom's largest music venues, having a maximum capacity of 60,000 for performances. It was the largest stadium concert venue in England before the new Wembley Stadium was built. The first concert was a performance by the Red Hot Chili Peppers supported by James Brown in 2004. An Oasis concert at the ground was featured on the DVD, Lord Don't Slow Me Down and the band's concert in 2005 set the attendance record of 60,000. Take That released a DVD of their 2006 performance at the stadium, Take That: The Ultimate Tour. Other artists who have played the stadium are U2, Beyoncé, Jay-Z, George Michael, Rod Stewart, Foo Fighters, Pet Shop Boys, Manic Street Preachers, Bastille, Dizzee Rascal, The Futureheads, the Sugababes, Taylor Swift, Sophie Ellis-Bextor, Coldplay, Bruce Springsteen, Muse, Bon Jovi (three times), Robbie Williams, One Direction, and The Stone Roses. In May 2011, the stadium hosted the Conference National play-off final between AFC Wimbledon and Luton Town; Wimbledon gained promotion to the Football League after beating Luton in a penalty shoot-out. The stadium was used for the play-offs because the 2011 UEFA Champions League Final was due to take place at Wembley on 28 May 2011 and UEFA regulations stipulate the stadium hosting the Champions League final must not be used for other matches during the previous two weeks. On 10 October 2015 it hosted a 2015 Rugby World Cup Pool A match between hosts nation England and Uruguay. England won 60–3 with 50,778 in attendance. ^ Increased capacity due to completion of third tier on South Stand. ^ Reduced capacity due to South Stand expansion. Construction work phasing meant the maximum capacity varied over the course of the season. ^ Take That were originally scheduled to play three concerts at the Manchester Arena on 26, 27 and 28 May 2017. However following the Manchester Arena bombing on 22 May, the Arena temporarily closed for four months. 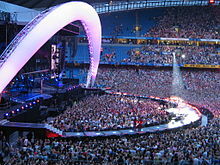 The three concerts were subsumed into one and held at the Etihad Stadium on 18 June. ^ a b c "Manchester City strike deal to rename Eastlands". BBC Sport. 8 July 2011. Retrieved 13 November 2011. Manchester City have confirmed the City of Manchester Stadium will be renamed the Etihad Stadium after signing a ten-year deal with the airline. ^ a b "City of Manchester Stadium wins Inclusive Design Award". RIBA. 2004. Archived from the original on 20 June 2015. Retrieved 20 June 2015. This outstandingly beautiful arena is a totally designed, innovative and brilliantly organized modern football stadium that started life as the main venue for the 2002 Commonwealth Games and now is home to Manchester City FC. ^ a b c d "Man City stadium given Uefa final". BBC Sport. 4 October 2006. Retrieved 28 October 2010. ^ a b "England 1-1 Japan". BBC Sport. 1 June 2004. Retrieved 23 June 2015. ^ a b Lamont, Tom (29 June 2008). "City of Manchester Stadium". The Observer. London: Guardian News and Media. Retrieved 22 August 2011. ^ Lucas, Dan (10 October 2015). "England v Uruguay: Rugby World Cup 2015 – as it happened" – via www.theguardian.com. ^ a b "Manchester 'may sue IOC'". BBC News. 25 January 1999. Retrieved 11 November 2011. ^ a b Hubbard, Alan (12 December 1999). "City of Manchester Stadium: The Wembley rescuers". The Independent. London: Independent Print Limited. Retrieved 7 January 2008. The athletics track would be dismantled to allow the seating capacity to be increased from 38,000 to 48,000. ^ a b c d e f Conn, David (4 October 2011). "Manchester City to pay council £2m a year for stadium naming rights". The Guardian. London: Guardian News and Media. Retrieved 12 November 2011. ^ a b Bhatti, Pav (21 May 2011). "Maine Road: The community Manchester City left behind". BBC News. Manchester. Retrieved 23 June 2015. Manchester City spent 80 years at Maine Road Stadium before they moved to Eastlands in 2003. ^ a b c d e "Manchester model shows how West Ham can be settled tenants". London Evening Standard. ES London Limited. 11 October 2011. Archived from the original on 12 October 2011. Retrieved 12 November 2011. ^ a b c d e f g Simpson, Martin & King, Mike (December 2003). "Building Tension" (PDF). msc.aisc.org. Modern Steel Construction. Retrieved 11 June 2015. ^ a b c d "Etihad Stadium, Manchester – Awards". arupassociates.com. Arup Associates. Retrieved 10 June 2015. ^ "Manchester City seek stadium expansion to hold 61,000". BBC News. Manchester. 11 October 2013. Retrieved 29 December 2013. ^ "Project: Eastlands' industrial past". oxford archaeology: exploring the human journey. Oxford Archaeology. 2010. Retrieved 11 June 2015. ^ "Designing the City of Manchester Stadium" (PDF). The Arup Journal. Arup Associates. January 2003. Archived from the original (PDF) on 27 March 2014. Retrieved 14 June 2015. ... emerging government legislation on urban renewal, which promised vital support funding and had implications for the final site of the proposed venue. Government became involved in funding the purchase and clearance of the Eastlands site in 1992. ^ Bonnet, Rob (31 July 2002). "Athletics' stadium claim is pipe dream". BBC Sport. Retrieved 19 November 2011. ^ Hubbard, Alan (12 December 1999). "City of Manchester Stadium: The Wembley rescuers". The Independent. London: Independent Print Limited. Retrieved 7 January 2008. But council sources say they are confident that the football club could be persuaded to allow the track to remain as a permanent feature with a retractable seating scheme, such as that in Paris's Stade de France which would further increase the capacity to 65,000. ^ Patel, Dipesh (7 November 2007). "Stadium is no white elephant but future is just a guess". The Guardian. London: Guardian News and Media. Retrieved 18 August 2011. ^ a b Hubbard, Alan (12 December 1999). "City of Manchester Stadium: The Wembley rescuers". The Independent. London: Independent Print Limited. Retrieved 7 January 2008. ... the foundation stone was laid for the nation's other super stadium for the millennium. The Prime Minister, Tony Blair, did the honours in Manchester on Monday. ^ "City of Manchester Stadium". Centre for Accessible Environments. Archived from the original on 25 September 2006. Retrieved 22 July 2006. Construction of the Stadium began in January 2000, with an immovable completion date set by the Commonwealth Games. ^ "City of Manchester Stadium". Commonwealth Games Legacy. Archived from the original on 25 November 2007. Retrieved 27 August 2006. ... with Sport England committing £77 million pounds to the cost and the City Council providing the remainder. ^ a b Taylor, David (16 May 2002). "A question of sport". The Architects Journal. Retrieved 11 June 2012. The Commonwealth Games stadium was to originally have a capacity of 38,000 – now 41,000 after better-than-expected ticket sales for the Games. ^ "Opening ceremony of the 17th Commonwealth Games, Manchester, 25 July 2002". The British Monarchy OWS. The Royal Household. 25 July 2002. Retrieved 22 August 2011. ^ Note: The term 'track and field' normally excludes 'road race' athletics events (e.g., men's 50 km race walk, women's marathon, etc.) from the other 'athletics' sport events. 'Road race' events may terminate in an athletics stadium but are not usually considered as having been staged there. Furthermore, race walking events were removed from the Commonwealth Games program after the 2010 Games. Although paraplegic athletics events are normally now included under the term 'track and field', two EAD records have been excluded from the tally of 'sixteen' stated in the article as they are often omitted from externally sourced lists of past Games records and thus become a frequent cause of confusion when included in such totals. ^ "Commonwealth Games Athletics Records" (PDF). commonwealth-of-nations.org. London: Commonwealth of Nations. Retrieved 13 June 2015. ^ "A history of the Commonwealth Games". heraldscotland. Glasgow: Herald & Times Group, Newsquest Media Group. 21 February 2014. Retrieved 14 June 2015. For the first time in the Games history, indeed at any multi-sport event in the world, a limited number of full medal events for elite athletes with a disability (EAD) were included in a fully inclusive sports programme. ^ Conn, David (10 October 2006). "No cut-price Olympic legacy for football's fat cats". The Guardian. London: Guardian News and Media. Retrieved 19 November 2011. ... and then the track was removed so the stadium could be handed to Manchester City on terms regarded as startlingly generous. ^ a b c d e f "Transforming the City of Manchester Stadium" (PDF). The Arup Journal. Arup Associates. February 2003. Archived from the original (PDF) on 30 March 2012. Retrieved 20 November 2011. ^ Note: 7,000 = capacity after conversion (48,000) less capacity for the Games (officially 38,000 but expanded to 41,000) = number of new permanent seats added (23,000) less the number of temporary seats dismantled (16,000). All capacity numbers used are rounded to 2 S.F. ^ Evans, Martin (2 September 2008). "Man City tops football rich league with Arab takeover". Daily Express. London: Northern and Shell Media Publications. Retrieved 4 September 2008. ^ Qureshi, Yakub (2 September 2008). "The new football powerhouse". Manchester Evening News. M.E.N. Media. Retrieved 4 September 2008. ^ "Manchester City FC submits plans for Etihad Campus". placenorthwest.co.uk. Manchester: Place North West. 19 September 2011. Retrieved 10 June 2015. ^ a b "Manchester City in £1.5m corporate facilities upgrade". BBC News. Manchester. 28 May 2010. Retrieved 10 October 2010. ^ a b c Keegan, Mike (2 October 2010). "Manchester City give council an extra £1m". Manchester Evening News. M.E.N. Media. Archived from the original on 5 October 2010. Retrieved 10 October 2010. ^ "Key business issues facing EPL franchises". SportsBusiness Journal. Street and Smith's Sports Group. 15–21 August 2011. Retrieved 21 November 2011. The club sells 36,000 season tickets annually. ^ Brennan, Stuart (23 March 2015). "Man City's soaring new stand to boost Etihad atmosphere". Manchester Evening News. Retrieved 2 June 2015. ... which will take the stadium capacity over 55,000, making it the third biggest club ground in the country after Old Trafford and Arsenal's Emirates Stadium. ^ Brennan, Stuart (23 March 2015). "Man City's soaring new stand to boost Etihad atmosphere". Manchester Evening News. Retrieved 2 June 2015. Manchester City's new, expanded South Stand is nearing completion and is pencilled in for an autumn opening. ^ "Manchester City ask fans about a potential safe-standing section in an expanded Etihad Stadium". talkSPORT. Retrieved 10 April 2019. ^ "City of Manchester Stadium". Building. UBM Built Environment. 2002. Retrieved 3 December 2013. ^ "How Old Trafford and the Etihad Stadium became world-famous sporting arenas and helped make Manchester". Manchester Evening News. 16 September 2016. Retrieved 4 January 2018. ^ Simpson, Martin & King, Mike (December 2003). "Building Tension" (PDF). msc.aisc.org. Modern Steel Construction. Retrieved 11 June 2015. The most visible features of the stadium are the 12 perimeter masts that rise as high as 70 m (230’) into the air. ^ "Borrowed & Blue – Weddings at the City of Manchester Stadium" (PDF). countybrides.com. CoMS Conference & Events / Manchester City Football Club. Retrieved 12 June 2015. ^ "Manchester City kicks off innovative smartcard services and sponsorships with wireless, RF-enabled Intelligent Stadium" (PDF). Hewlett-Packard. February 2004. Archived from the original (PDF) on 9 February 2006. Retrieved 27 August 2006. The contact-free solution admits up to 1,200 patrons per minute stadium-wide and also eliminates box-office queues. ^ a b Clayton, David (24 June 2011). "Dublin Super Cup: Aviva Stadium v CoMS". Manchester City Football Club. Retrieved 4 July 2011. ^ "Designing the City of Manchester Stadium" (PDF). Arup Journal. Retrieved 11 October 2017. ^ "Designing the City of Manchester Stadium" (PDF). The Arup Journal. Arup Associates. January 2003. Archived from the original (PDF) on 27 March 2014. Retrieved 14 June 2015. The inside 10m of the roof on all four sides is clad in transparent polycarbonate sheeting, allowing sunlight onto the pitch to assist grass growth and also ample daylight into the seating bowl. ^ "Designing the City of Manchester Stadium" (PDF). The Arup Journal. Arup Associates. January 2003. Archived from the original (PDF) on 27 March 2014. Retrieved 14 June 2015. The dramatic roof form and corresponding stand configuration allowed movable louvre vents in the high-level corner voids. These vents can be adjusted to increase or decrease airflow through the Stadium, and thus benefit not only air movement over the pitch but also the spectator environment. ^ "UEFA Cup Final on Special Pitch". PR Newswire Europe Ltd. 8 May 2008. Retrieved 22 November 2011. ^ Reynolds, John (14 May 2008). "UEFA Cup Final Venue (Mad for it)". Pitchcare. (Maxwell Amenity Ltd.). pp. 14–18. Retrieved 27 August 2009. ^ "Pitch perfect: Manchester City groundstaff win Premier League award". Manchester Evening News. M.E.N. Media. 4 May 2011. Retrieved 25 August 2011. ^ Mulholland, Paul (26 November 2010). "Top award for City groundstaff". MCFC OWS. Manchester City Football Club. Retrieved 11 June 2015. ^ Bailey, Chris (8 November 2006). "Why Blues must cash in on name game". Manchester Evening News. M.E.N. Media. Retrieved 22 April 2008. Some call it 'Eastlands', an area that doesn't officially exist on maps, some who like expending their breath call it by its Sunday best name 'City of Manchester Stadium', others prefer to shorten that to 'COMS' while still more refer to City's stronghold as 'Sportcity' in keeping with those nice brown signs that help everyone find their way to the complex. ^ a b "City and Etihad: An histotic day for the club" (web video). Manchester City Football Club. 8 July 2011. Retrieved 16 November 2011. ^ Gardner, Alan (8 July 2011). "Manchester City confirm stadium renaming in Etihad Airways agreement". The Guardian. Guardian News and Media. Retrieved 22 August 2011. ^ a b "City Football Academy: Fly-through". MCFC media release web video on YouTube. Manchester City Football Club & Rafael Viñoly Architects. 14 September 2012. Retrieved 3 June 2015. ^ Ogden, Mark (29 August 2011). "Manchester City taken to a whole new level with Sheikh Mansour's £1 billion investment". The Telegraph. London: Telegraph Media Group Limited. Retrieved 31 August 2011. The deal covers stadium-naming rights, shirt sponsorship and the area surrounding the ground which is now known as Etihad Campus. ^ a b James, Gary (Jan 2006). Manchester City – The Complete Record. Derby: Breedon Books Publishing. pp. 103–105. ISBN 978-1-85983-512-8. ^ a b Spencer, Pete (13 November 2003). "City stand by Bell". Manchester Evening News. M.E.N. Media. Retrieved 20 November 2011. ^ "THE LIST: 20–11 of the most atmospheric stadiums in football". Daily Mail. 24 December 2008. Retrieved 20 June 2015. Maine Road will always be one of English football's legendary grounds. ^ James, Gary & Turner, Ric. "The Etihad Stadium". Bluemoon (bluemoon-mcfc.co.uk). Manchester: Bluemoon-MCFC. Retrieved 17 June 2015. At the northern end a large temporary uncovered structure – the new Gene Kelly Stand as City attendees at the Games dubbed it – filled the end where the running track curved beyond the boundaries of a regular football pitch. ^ "The Etihad". footballtripper.com. Football Tripper. Retrieved 17 June 2015. The Etihad is comprised of the following four sections: The Family Stand (North), The East Stand, The South Stand and the Colin Bell Stand. ^ James, Gary & Turner, Ric. "The Etihad Stadium". Bluemoon (bluemoon-mcfc.co.uk). Manchester: Bluemoon-MCFC. Retrieved 17 June 2015. THE SOUTH STAND (originally referred to as the Scoreboard End): Converted into a tier two stand after the Games, this end houses the Legends Lounge, away supporters and City’s more vocal fans. ^ Inglis, Simon (2004). Played in Manchester. London: English Heritage. ISBN 1-873592-78-7. ^ "Manchester Rangers hint at professional future after Eastlands move". loverugbyleague.com. Love Rugby League. 25 February 2015. Retrieved 19 June 2015. ^ a b "About". National Cycling Centre. Retrieved 19 June 2015. ^ a b Ottewell, David (8 August 2012). "Fast track to glory: How Manchester Velodrome forged Britain's Olympic gold rush". Manchester Evening News. M.E.N. Media. Retrieved 20 June 2015. The council-owned Velodrome, built with £6.5m of government money and £3m from the Sports Council and Foundation for Sport and the Arts, was Britain’s only Olympic-standard indoor track when it opened 18 years ago. ^ "EIS: About". eis2win.com. English Institute of Sport. Retrieved 23 June 2015. ^ "Manchester Regional Tennis Centre". manchester.gov.uk. Manchester City Council. Retrieved 23 June 2015. ^ "Manchester Tennis & Football Centre" (PDF). manchestersportandleisure.org. Manchester Sport & Leisure Trust. Retrieved 23 June 2015. ^ "Spirit of Friendship Festival Events". BBC News. March 2002. Retrieved 24 June 2015. ^ "'The Runner' Unveiled". BBC News. 10 July 2002. Retrieved 24 June 2015. ^ "Figurative Sculpture – The Runner". colinspofforth.com. Colin Spofforth Studio. Archived from the original on 4 March 2016. Retrieved 24 June 2015. ^ "30ft bronze sculpture unveiled by Steve Cram". m2002.thecgf.com. Commonwealth Games Federation. 9 July 2002. Retrieved 24 June 2015. The sculpture is 30 feet high and weighs seven tonnes making it the largest bronze sculpture dedicated to sport in the United Kingdom. It was sculpted in a little over eight weeks and cast and finished in three months. ^ "Work starts on Bang dismantling". BBC News. 15 April 2009. Retrieved 15 April 2009. ^ Cox, Charlotte (5 June 2014). "Cheque, mate? 'B of the Bang' cash pays for £341,000 giant chess pieces coming to Beswick". Manchester Evening News. M.E.N Media. Retrieved 5 June 2015. Created by artist Ryan Gander and dubbed ‘Dad’s Halo Effect’, the £341,000 work has been built using the refund from the B of the Bang – the 184ft structure taken down in 2009 after a succession of spikes fell off. ^ "Man City vanquish Barca". BBC Sport. 10 August 2003. Retrieved 17 November 2011. ^ "Man City v Barcelona photos". BBC Sport. 10 August 2003. Retrieved 17 November 2011. ^ "Man City off to a flyer". BBC Sport. 14 August 2003. Retrieved 17 November 2011. ^ "Premiership round-up". The Telegraph. London: Telegraph Media Group Limited. 23 August 2003. Retrieved 30 January 2010. Portsmouth followed up their victory over Aston Villa last week by drawing with Manchester City 1–1 in the first league match to be played at the City of Manchester Stadium. ^ "Sommeil saves City". BBC Sport. 23 August 2003. Retrieved 24 May 2015. ^ McNulty, Phil (21 March 2012). "Man City 2–1 Chelsea". BBC Sport. Retrieved 25 June 2015. CITY SET NEW RECORD – Manchester City have set a new Premier League record of 20 consecutive home wins. ^ Lindsay, Clive (14 May 2008). "Zenit St Petersburg 2–0 Rangers". BBC Sport. Retrieved 9 June 2015. Note: The crowd attendance of "47,500" quoted in this article is wrong according to many other source reports for this match. According to UEFA the official attendance for this game was "43,878", but given that there were upwards of 95,000 ticketless Rangers fans in Manchester on the day of the game, all trying to gain access to the stadium anyway they could, this "official attendance" figure may indeed have been unofficially exceeded. ^ "UEFA Cup Final 2008 – Is Manchester Ready?". Soccerlens.com – Football Blog. 13 May 2008. Retrieved 9 June 2015. Tickets for the final were divided roughly as follows; 13,000 per club (later adjusted to 17,000 for Rangers and 9,000 for Zenit), 11,000 on general sale via the UEFA website ballot in the early months of 2008 and then around 7,000 on the corporate side. The figures above take into consideration that the capacity is already reduced by between 3,500 and 4,000 for the fixture. ^ a b "Uefa Cup violence 'started early'". BBC News. 16 June 2008. Retrieved 9 June 2015. About 130,000 Rangers fans were in Manchester for the final, which brought £20m to the city's economy ... The study said the 37,000 Rangers fans inside the City of Manchester stadium were well behaved and 'a credit to the club'. ^ a b c "MCFC Stadium History". MCFC OWS. Manchester: Manchester City Football Club. 8 February 2008. Archived from the original on 8 February 2008. Retrieved 18 May 2015. Note: This original MCFC OWS source, located via the Wayback Machine Internet Archive, supports the stated stadium capacity value of 47,726 for all years prior to its publication – i.e., 2003 through 2007. ^ Cram, Steve (1 August 2002). "The best Britain has seen". BBC Sport. Retrieved 20 November 2011. ^ Henderson, Charlie (28 July 2002). "Stadium is star of the Games". BBC Sport. Retrieved 20 November 2011. ^ "Building prize for 'icon Gherkin'". BBC News. 16 October 2004. Retrieved 7 January 2008. Other winners at this year's ceremony included the City of Manchester stadium, designed by Arup Associates. It won the RIBA Inclusive Design Award for great design in a safe and convenient environment. ^ Britton, Karen (3 July 2014). "Etihad Stadium hits a winner as it's named one of England's top landmarks". Manchester Evening News. M.E.N. Media. Retrieved 15 June 2015. The people who built Manchester City's home are set to be honoured at a special ceremony after it is included in a list of the country's most recognisable structures. ^ "Fans are buzzing as City ticket sales rise". Manchester Evening News. M.E.N. Media. 17 July 2010. Retrieved 20 November 2011. Sales of the Seasoncards ... have already passed the total of 33,000 sold last summer. It is the highest tally for seven seasons, since a club-record 36,000 were sold for the first campaign at Eastlands in 2003/04. ^ "City has 'best' football stadium". BBC News. 2 September 2005. Retrieved 21 November 2011. Fans prefer visiting Manchester, with Old Trafford and the City of Manchester stadium coming first and second in a list of their favourite venues. ^ "Premier League lures overseas visitors to UK". BBC News. Business. 19 August 2011. Retrieved 22 August 2011. The most popular stadiums for overseas visitors were those of Manchester United, Liverpool, and Manchester City. ^ Brennan, Stuart (23 March 2015). "Man City's soaring new stand to boost Etihad atmosphere". Manchester Evening News. M.E.N. Media. Retrieved 2 June 2015. The 1894 Group, which aims to improve the atmosphere at the Etihad Stadium, is working with the club ... in a bid to re-create the formidable noise the Kippax used to generate at Maine Road. ^ "City win VisitFootball Club of the Year and Warmest Welcome!". mcfcsupportersclub.co.uk. Manchester City F.C. Supporters Club. 14 October 2014. Archived from the original on 20 May 2015. Retrieved 19 May 2015. Manchester City Football Club is to receive two awards for the quality of their customer care to Premier League fans last season. The VisitFootball Awards are part of a national scheme that is improving standards of fan experience at football stadia. ^ "Four clubs receive inaugural VisitFootball awards". premierleague.com. Premier League. 16 October 2012. Archived from the original on 5 June 2015. Retrieved 19 May 2015. Arsenal, Fulham, Liverpool and Manchester City first clubs to scoop VisitFootball Awards. ^ "City stadium expansion: more cut price tickets could be available". Manchester Evening News. M.E.N. Media. 19 August 2011. Retrieved 15 October 2014. Put simply, Manchester City are the gold standard in providing fans with the best matchday experience. ^ "Manchester City Close to Finalising Record Stadium Naming Rights Deal with Abu Dhabi-Owned Sponsor". Goal. PERFORM Media Sales. 13 May 2011. Retrieved 22 August 2011. ^ Williams, Jennifer (8 January 2015). "Manchester City to put new sports village on map with giant signs visible from above". Manchester Evening News. M.E.N. Media. Retrieved 31 May 2015. ^ Linton, Deborah (19 September 2011). "Video and picture gallery: How Manchester City's training village will look". Manchester Evening News. M.E.N. Media. Retrieved 16 November 2011. ^ Lambert, Callum (9 April 2015). "Manchester City: The future of women's football?". quaysnews.net. Manchester: University of Salford. Archived from the original on 15 June 2015. Retrieved 3 June 2015. Perhaps the most crucial part of their future development came last December when the club opened their new £200 million City Football Academy (CFA): a state-of-the-art base that accommodates 450 players ranging from junior teams to the men’s and women’s senior squads. ^ Lambert, Callum (9 April 2015). "Manchester City: The future of women's football?". quaysnews.net. Manchester: University of Salford. Archived from the original on 15 June 2015. Retrieved 3 June 2015. Formerly recognised as Manchester City Ladies, they became an official part of the club in 2012 with the intention of becoming a major force in the women's game. ^ "City Football Academy: History". MCFC OWS. Manchester City F.C. 8 December 2014. Retrieved 31 May 2015. ^ Coyle, Simon (2 March 2014). "Pictures and Video: New bridge at Manchester City's Etihad campus lowered into place". Manchester Evening News. M.E.N. Media. Retrieved 31 May 2015. ^ "Manchester City confirm new Swiss link". sportspromedia.com. London: SportsProMedia Limited. 26 November 2014. Retrieved 4 June 2015. ^ "Official opening of the community bridge connecting the Etihad Stadium to the soon-to-be-opened City Football Academy". MCFC OWS. Manchester City F.C. 26 November 2014. Retrieved 4 June 2015. ^ "Premier League: Chancellor George Osbourne [sic] opens Manchester City Academy". skysports.com. Isleworth: Sky plc. 8 December 2014. Retrieved 4 June 2015. ^ "City Football Academy Opens". MCFC media release web video on YouTube. Manchester City Football Club. 8 December 2014. Retrieved 5 June 2015. ^ "Beswick Community Hub" (PDF). North West Construction Hub. 2013. Archived from the original (PDF) on 1 June 2015. Retrieved 31 May 2015. ^ Fitzgerald, Todd (20 January 2015). "'Manchester City' college has students achieving their goals and heading for top of the table". Manchester Evening News. M.E.N. Media. Retrieved 31 May 2015. ^ Williams, Jennifer (31 October 2014). "Beswick's new £9m leisure centre makes a splash as it opens its doors to the public". Manchester Evening News. M.E.N. Media. Retrieved 31 May 2015. ^ Williams, Jennifer (5 February 2015). "New £18m sports science institute at Manchester City's Etihad complex is given go-ahead". Manchester Evening News. M.E.N. Media. Retrieved 31 May 2015. ^ "Dad's Halo Effect: 'Globally admired' Ryan Gander work revealed". BBC News. Manchester. 26 November 2014. Retrieved 5 June 2015. ^ "Manchester's industrial past honoured by stainless steel chess sculptures". theguardian.com. London: Guardian News and Media Limited. 26 November 2014. Retrieved 5 June 2015. ^ Puttick, Kate (29 November 2014). "Dad's Halo Effect: B of the Bang fiasco 'must not put Manchester off public art'". mancunianmatters.co.uk. Manchester: Mancunian Matters. Retrieved 5 June 2015. ^ "Metrolink – East Manchester line". Transport for Greater Manchester. Retrieved 19 May 2013. ^ "Metrolink from Manchester to Droylsden to open in February". BBC News. Manchester. 6 December 2012. Retrieved 17 December 2012. ^ "Manchester City – Etihad Stadium (see under "By Train and Metrolink" tab)". footballgroundguide.com. Football Ground Guide. 25 May 2015. Archived from the original on 11 June 2015. Retrieved 10 June 2015. ^ "Manchester City – Etihad Stadium (see under "Directions and Car Parking" tab)". footballgroundguide.com. Football Ground Guide. 25 May 2015. Archived from the original on 11 June 2015. Retrieved 10 June 2015. ^ a b c d e f Linton, Deborah (15 June 2010). "Concerts are back at City's stadium". Manchester Evening News. M.E.N. Media. Retrieved 29 October 2010. ^ "Concerts – Hospitality – Manchester City FC". Manchester City Football Club. May 2008. Retrieved 28 October 2010. ^ "Manchester City bid for entertainment licence to bring more concerts to Etihad stadium". Manchester Evening News. M.E.N. Media. 21 April 2012. Retrieved 3 May 2012. ^ a b "Blues stadium is top rock venue". Manchester Evening News. M.E.N. Media. 29 November 2003. Retrieved 20 August 2011. ^ "Manchester City kicks off innovative smartcard services and sponsorships with wireless, RF-enabled Intelligent Stadium" (PDF). Hewlett-Packard. February 2004. Archived from the original (PDF) on 9 February 2006. Retrieved 21 November 2011. And it can function as a 60,000-seat concert arena—the largest stadium performance site in the UK. ^ Long, Chris (22 November 2006). "Take That – The Ultimate Tour". BBC Manchester. Retrieved 11 August 2009. ^ "Robbie Williams concert: In pictures". MCFC OWS. Manchester City Football Club. 19 June 2013. Retrieved 10 June 2015. ^ "One Direction to play Etihad Stadium in Manchester next year". Manchester Evening News. 17 May 2013. Retrieved 17 May 2013. ^ "Oakwell to host Man City Uefa tie". BBC Sport. 20 June 2008. Retrieved 21 November 2011. City needed an alternative venue because of the time required for the City of Manchester Stadium pitch to recover from this summer's events. ^ "City face Faroe Isles opposition in UEFA Cup". MCFC OWS. Manchester City Football Club. 20 June 2008. Retrieved 10 June 2015. City’s home leg of the tie will be played at Barnsley’s Oakwell ground two weeks later and will be Mark Hughes’ first competitive game in charge of the Blues on British soil. ^ "UEFA Stadium Infrastructure Regulations: Edition 2010" (PDF). Union of European Football Associations. 2010. Retrieved 9 January 2015. ^ "2005: Official approval for EURO success". UEFA. 2005. Retrieved 15 November 2011. ... with the opening game – England's thrilling 3–2 victory against Finland at the City of Manchester stadium on Sunday 5 June – attracting 29,092 fans, a record for a women's match in Europe. ^ Ryan, Mark (21 May 2011). "AFC Wimbledon 0 Luton Town 0 (aet, 4–3 on pens): Dons promoted to Football League". Daily Mail. London: Associated Newspapers Ltd. Retrieved 21 May 2011. ^ "Blue Square Bet Premier final moves to Manchester". BBC Sport. 24 September 2010. Retrieved 21 May 2011. ^ "Rugby League Project – Great Britain vs. Australia". Rugby League Project. 30 October 2004. Retrieved 30 July 2010. ^ Barker, Neil (3 July 2014). "Magic Weekend not coming to Etihad Stadium". Manchester Evening News. M.E.N. Media. Retrieved 10 June 2015. City are at home in the final week of the Premier League season and building work at the site will commence immediately after this ... A return to the event's adopted Manchester home seems likely however in the future. ^ "Top 10 boxing matches held in stadiums". ESPN Sports Media Ltd. 14 February 2014. Retrieved 19 May 2015. 55,000 fans – a post-war record attendance for a British fight – welcomed Hatton into the ring to a rousing rendition of 'High Ho Ricky Hatton' and his original crowd pleaser, Blue Moon. ^ "Rugby World Cup 2015 – Match Schedule". rugbyworldcup.com. Dublin: World Rugby. Archived from the original on 13 June 2015. Retrieved 11 June 2015. ^ "Pool A, England v Uruguay. Manchester city stadium". Rugby World Cup. 10 October 2015. Retrieved 11 October 2015.